Just received the following stuff on the Diageo Special Releases for this year, so thought I’d better share. I’m going to a tasting of these tomorrow night, so will post my own impressions later in the week. The full line-up has already been revealed on various sites, so I won’t publish much of the bumf – just the official tasting notes and photos for starters. Appearance: Rich, deep mahogany with good beading. Nose: Classic, muscular Benrinnes with an added and immensely seductive sweetness rippling through it. Crème brulée with a highly caramelised surface. Intense black fruits (prunes), Christmas cake and dates, laced with rich sherry. Behind, a beefy note with some allspice, like a touch of gravy left in the meat pan. Water (just a splash) initially brings the toffee-apple sweetness even more into focus above such meatiness. As it becomes waxier the fruity notes withdraw, yet some moist Christmas cake remains – much later, the meatiness reasserts itself. Superb balance and complexity. Body: Heavy. Full. Immediate grip. Palate: Big, powerful and immediately assertive. Sweet, then mouth drying, yet not astringent because that concentrated sweetness remains. Waxy-viscous texture; slight traces of brimstone. Raisin and lots of date. Softens as it moves slowly across the tongue. Water lightens the grip and introduces a lightly smoked character. The voluptuous texture is countered by tannic dryness. Sweet to start and beefy, in all senses. Very, very good. 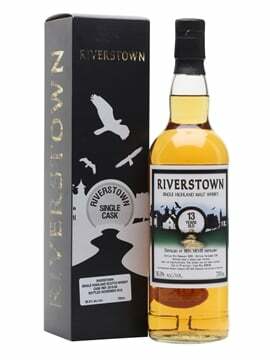 Finish: Exceptionally long, dry and warming, leaving a mellow, lingering aftertaste of treacle and sandalwood. 30 Years Old Natural Cask Strength Single Malt Scotch Whisky from the Coastal Highlands. Nose: Big and resolutely oily. Evoking a wind-surfers’ camp fire in the dunes – wet saltiness and dry, grassy wood-smoke. The herbal element here is soon joined by lychee, black pepper and meaty notes. Clean, but rich, robust and deep as well. With water there’s a touch of American oak butterscotch softness, which in true Brora fashion then gives way to waxier notes, as with a waxed country jacket. Gentle and soft, yet with a brooding edge. Body: Medium to heavy. Oily, smooth. Palate: Tongue-coating and surprisingly citric. Firm oak. Shows its refined maturity in waves of flavour that surge across the tongue. It needs water, but just the merest drop, which allows the texture to show itself. Full fleshy fruits. Rich and smooth, with hints of smoke. Finish: Long, pleasingly nutty and smoky. 10 Years Old Natural Cask Strength Single Malt Scotch Whisky from the Isle of Islay. Appearance: Pale gold. Little beading. Nose: Great intensity and youthful brio. Very pure, clean and punchy, with plenty of alcohol. Green melon, grass clippings and as the alcohol lifts just a little, traces of fermenting pear juice. Over time there’s the sweetness of sherbet, lime and fresh mint, plus just the tiniest charred hint of smoke or toast in the background. Rather than bring out an older Caol Ila’s “fire in the hospital” character, water transforms it into an artist’s studio: a fresh painted canvas set to dry, with beautiful vanilla notes. Summery sweetness too; sugary candy floss and soft fruits. Palate: A grassy picnic by the sea. Vibrant, hot and clean with a spring-like abandon: all flowers, grass and green fruits (fresh apple). High acidity increases the mouth-watering impression and there are notes of lime and even petrol here too. Water makes it succulent; intense in character but also fresh and mouth-cleansing. Sweeter than expected, as some banana emerges. The balance is restored by good acidity and saltiness: there’s no smoke. Finish: Warming and gentle with great length. 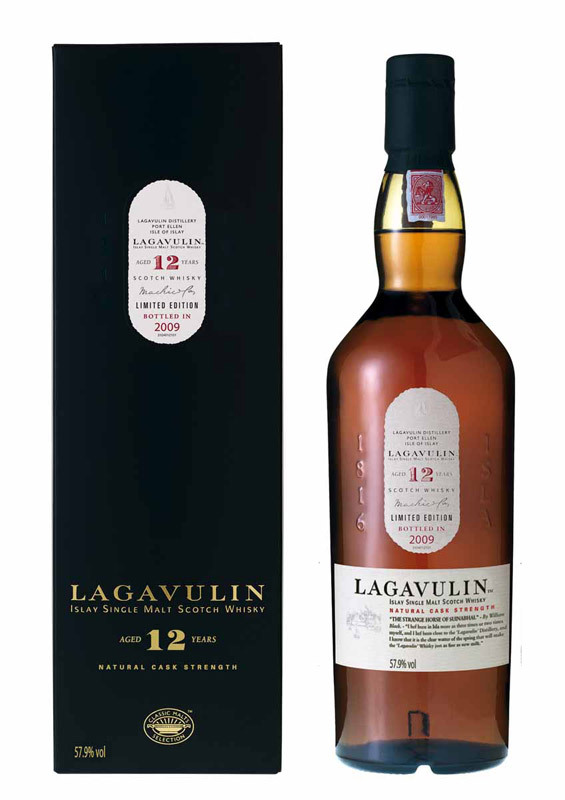 12 Years Old Natural Cask Strength Single Malt Scotch Whisky from the Isle of Islay. Appearance: Pale gold. Good beading. Nose: Huge, fine and complex. Intense, abundant smoke surges out of the glass, yet it’s fragrant smoke that doesn’t obliterate the softer mossy scents here. After a while carbolic soap, lightly smoked haddock and an intensely sweet and fruity tinned fruit salad. The onslaught continues with wasabi on fresh herring, or ozone in a gale on the pier. Lightly sooty, developing smoked cream cheese. Water surprisingly softens the gale to a breeze, easing back on the medicine and allowing mineral and woody notes to emerge, with some bath salts. Body: Light but hugely smoky. Palate: Starts dry and vibrant, with masses of intense smoke. Again smoked cheese, softer now, under that fresh young character. Sooty, yet so sweet! Uncompromising, yet ebullient and hugely fragrant. In time there’s a hint of violets, before pipe smoke appears. Water allows the sweet centre to show. The taste now is even more youthful – surprisingly sweet, with nice acidity, it leaps all over your tongue. All this softens with further sips and an elegant balance shows through. A classic! Finish: Medium to long. Firm and dry, a final blast of smoke. 18 Years Old Natural Cask Strength Single Malt Scotch Whisky from Speyside. Appearance: Rich amber, polished bronze. Very slight beading. Nose: Slow to rise. At first, a forest floor in autumn: damp air, earthy and wet. 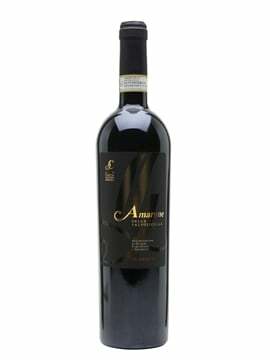 Above this, sweeter notes, soon developing into a compote of fresh autumn fruits; ripe berries, with some red apple. Later, very distant smoke and hints of antiseptic. Later still, a surprising and sparky orange zest. Overall, quite light and well structured. Water makes things softer and more elegant, bringing forth gentle orange fruit gums over hints of creamy caramel. Body: Light, yet also lightly oily and tongue-coating. Palate: Very hot, powerful and urgent at full strength. Immediate orange oil, then a developing complexity. Toasted cereal notes, tarte au chocolat scented with orange and a little ginger, the bite of a fruit compote. At once light and drying, yet deliciously oily with a particularly well balanced acidity. Very late and subtle cocoa with hints of cigar box cedar. Water cools things down; it’s all lighter, cooling and minty now, with some boiled fruit-sweets. Finish: Long and persistent. Although hot and drying, remains smooth, silky, warming and delicate, with a sweetly fragrant rose-water aftertaste. 20 Years Old Natural Cask Strength Single Malt Scotch Whisky from Speyside. Appearance: Pale Gold. Light beading. Nose: Green, olive-oily then immediately fruity (oranges, white peaches), but soon develops a milk chocolate note. As it begins to open there’s a fleeting, mineral aroma, which adds a racy air, before it settles down as orange cream filling in milk chocolate or perhaps angelica cake decoration. 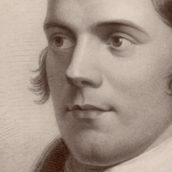 Water improves things significantly, raising the mineral note again – grassy, and fresh cut grass at that – then introduces a fruity note, suggesting pineapple or green apple. Palate: Appetising. There’s plenty of crisp, clean grassiness on show here. Sweet, but also slightly sharp (crisp green apples, surprising in such a long-matured malt). Again water helps, making it all clean, fresh and acidic, with a surprising trace of salt. At its heart, the mineral taste dominates. Very slightly oily. Finish: Short to medium, then warming. 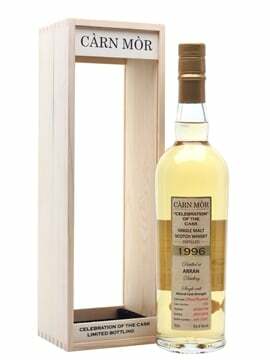 30 Years Old Natural Cask Strength Single Malt Scotch Whisky from the Isle of Islay. Appearance: Full, burnished gold. Good beading for its age. Nose: One of the best Port Ellen noses recorded. Little nose prickle yet still lively. Complex, rich and rounded, with soft pear fruit and a trace of tar, as in a driftwood bonfire. Sandy but also slightly sweet, with malty traces. Behind this, fresh shellfish: scallop, oyster with a touch of lemon. The fruity notes fade to samphire and smouldering oiled wood (that bonfire). Water has a calming effect, raising a classic extra virgin olive oil note whilst adding fresh maritime notes and a herbal hint (sage?). Further dilution reigns in the smoke and some boiled sweet notes emerge. Palate: More classic. Surprisingly sweet at first, with massive smokiness. Austere and flinty with a very light grip. Salty. 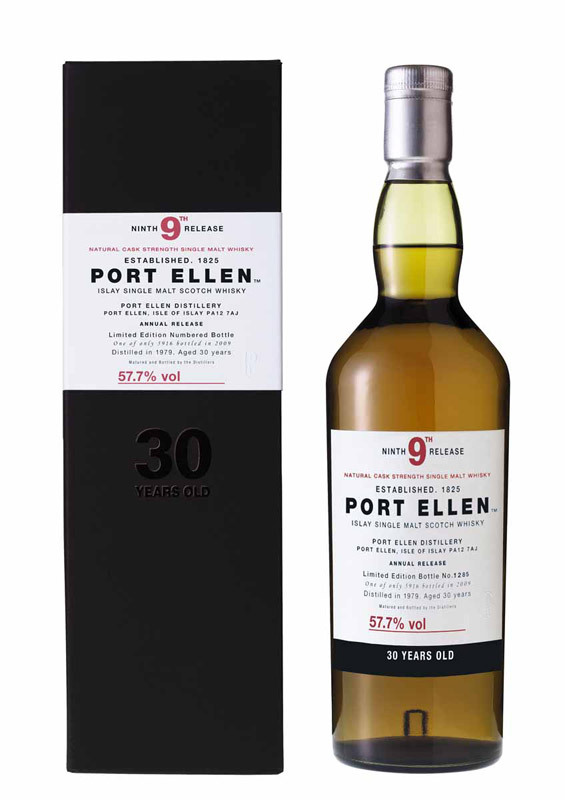 The smoke dominates but the character remains pure, focused Port Ellen and is everything you’d expect. A good drop of water softens things at last, producing a lovely texture and great viscosity. As the sweetness fades, the delivery of flavours shifts to the centre of the palate, with more light saltiness. Finish: Very long and warming, with lingering peat-smoke. 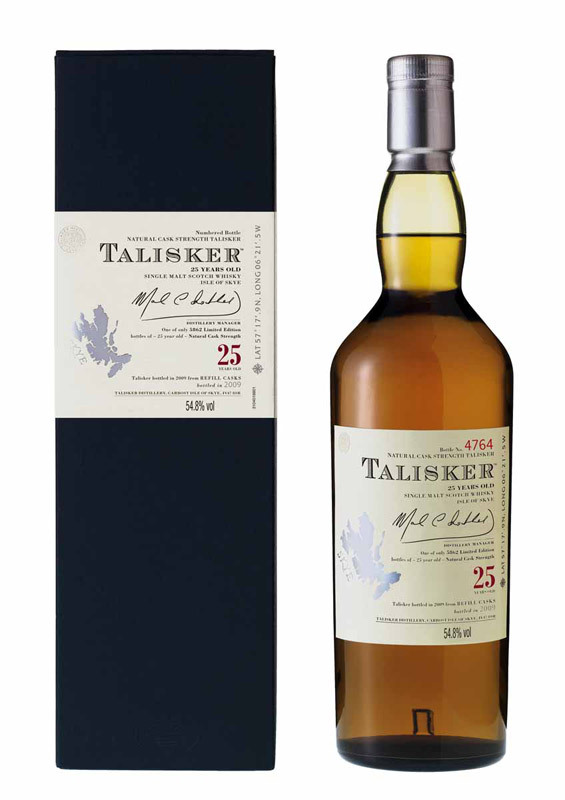 25 Years Old Natural Cask Strength Single Malt Scotch Whisky from the Isle of Skye. Appearance: Pale amber. Good beading, attractive viscosity. Nose: Mellow, with little prickle. Juicy and sweet, with a trace of smoke and pencil boxes behind. Soon opens out to heathery, earthy peat. After that, fruit: fresh-baked apple cake, banana, quince. Finally, salt: seaweed and ocean. Ever-changing, becoming more delicate in time. Water raises orange peel and brings in more maritime notes to balance the sweet fruitiness – warm sand, dry seaweed. 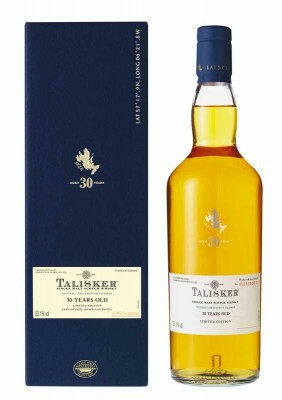 Palate: Fine Talisker character; not as powerfully peppery as younger expressions, drinking well at natural strength. Sweet, with some salt. Coats the lips, never mind the tongue. Begins with soft, sweet apple sponge in custard, then a drier crisper character emerges on the middle of the tongue. Builds in power (and heat) as the inevitable pepperiness comes forward. Yet also continues sweet, returning to its unctuous beginnings. Adding water smoothes the texture and merges the flavours. Again starts sweetly, with balancing acidity overall and plenty of salt. Finish: Medium to long. Lulls you into a sense of security, then pounces. Warming, with both pepper and, unexpectedly, peppermint. 30 Years Old Natural Cask Strength Single Malt Scotch Whisky from the Isle of Skye. Appearance: Gold, with little beading. Nose: The softly muted character of age. 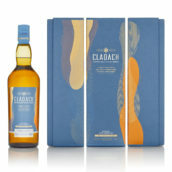 Mild and unusually fruity (citrus), fading quickly into lush seaweed with charred sticks – as with a spent fire, in which the charcoal and peat embers barely glow. Soon becoming soft and very slightly waxy or creamy, like fudge. Needs little or no water, but a drop freshens things, bringing up drying wooden fish boxes and a return of the tangy fruit (tart plums). Then it all drifts away into charred old wood. Palate: Drinks well at full strength and has a pleasant, teeth-coating texture. The smoke is immediate and dry with creamy oak. Almond milk and light, sweet stone fruits emerge, joined by a trace of salt, as with peat moss in the rain or seaweed. Water (add only a little) brings up a pleasant smooth texture. It’s now quite sweet to start but less so overall, with some salt and a trace of cloves. Finish: Long and gently warming, with salty seaweed in the lingering maritime aftertaste and just a white pepper tingle on the tongue in place of that chilli pepper ‘catch’. Okay, this is me again now. Interesting, eh? I’m really looking forward to trying these tomorrow, particularly the Benrinnes, Pittyvaich and Mannochmore, which I can exclusively reveal will be available for tasting at The Whisky Show 2009, which we’re co-hosting, along with the relaunched Royal Lochnagar Select Reserve and the delicious Caol Ila 10yo mentioned above that I tried at this year’s Feis Ile. I’ve been told that there might be a few surprises ‘under the table’ as well :). Obviousy these RRPs are subject to change (as we’ve already seen with Laphroaig 18 and Ardbeg Corryvreckan) and are not necessarily what TWE will be charging when they come out. Still, there’s more than a couple of points of interest worth discussing here: please, don’t be shy, have your say. Looking forward to the Lag 12 again this year. Hoping it will squeeze in at under my self-imposed max of £50. 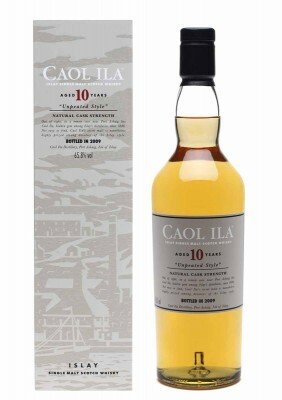 Not a fan of the unpeated Caol Ilas at all so won’t buy that anyway. The rest are just too pricey as usual but at least not ‘Manager’s Choice’ stupid. I am also looking forward to the Lagavulin 12 yo. My 2008 Special Release is almost gone, so hope this one will be just as good as the 2008. I think this is much more constrained (prices) then the manager choice’s, while just as good or maybe better whiskies. 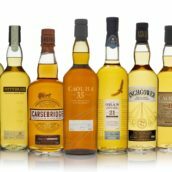 Well I know everyone loves to moan about Diageo pricing (tedious really, given some of the things we could be moaning about), but compared to £225 for a Laphroaig 25 year old many of these are looking distinctly cheap. 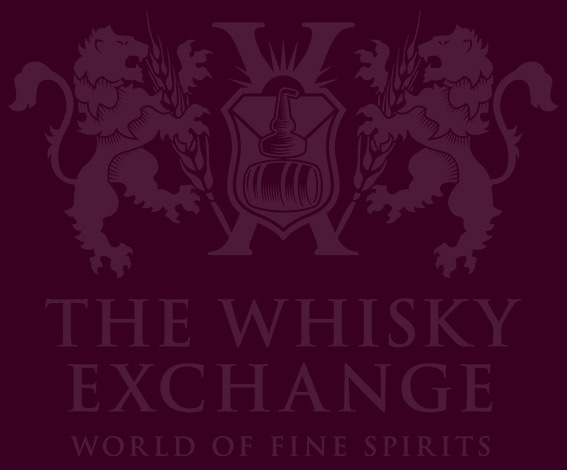 Talking about Laphroaig 25 yo…when is TWE getting a new Whisky of the Month? 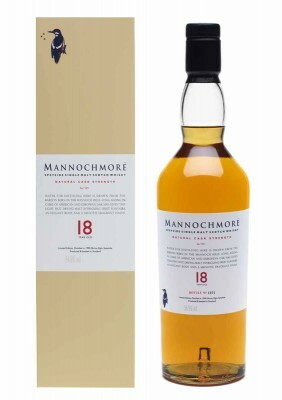 The 25 yo must be so good, that it’s the whisky of the month 6 months running. Rather a few one would want to have – although rather few one would like to pay to have. 9th annual release PE? Come on…it may be seriously good (and the AR’s have typically been that), but how serious is it when it does the same trick the ninth time – curiosity finally killed the fat cat? But interesting price pointing between the 30 yo PE, Brora and Talisker. The extinct one is the cheapest – sorry least expensive. 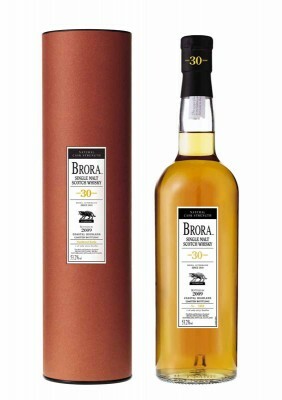 But Brora, which seems to be getting very scarce, is not all that much more costly. In a relative sense, that is. One alternative to all this is of course not to buy any of them and get a cask of new make instead. Will last longer and probably get you more friends in the end. Sigh…why are there limits to the bank account? 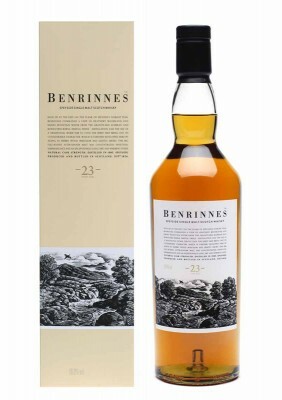 I was thinking of getting the Benrinnes, Mannochmore and Pittyvaich as well as the Laga and Caol Ila but at those prices I think I’ll give them a miss. Pity. I was looking forward to them. 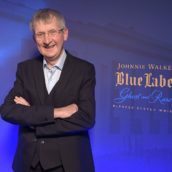 Willie, that’s why I’m so pleased they’re coming out at the Whisky Show! The Brora 30 yrs old is probably the best bottling in recent memory. Simply incredible!